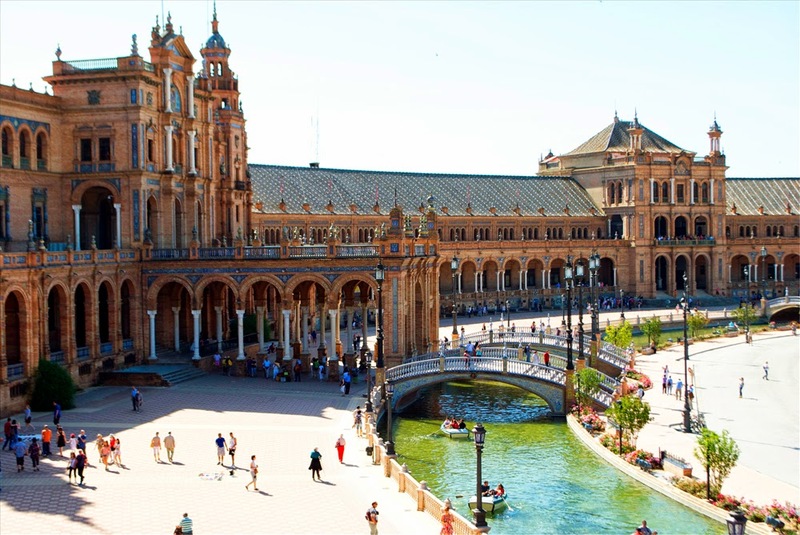 While in southern Spain I wanted to continue my travels by visiting Seville (Sevilla). 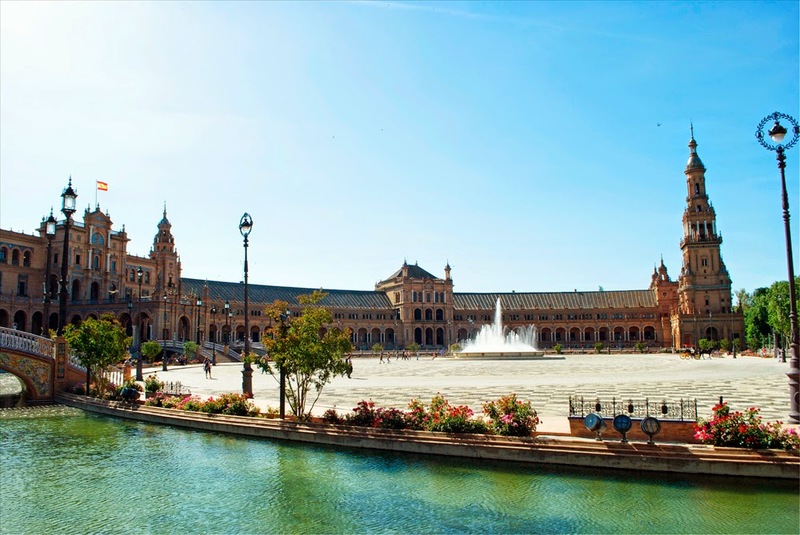 Seville was a 1 hour train ride from my home stay in Puerto de Santa Maria and I had class that night so I only had 5 hours to explore Seville with my classmate. 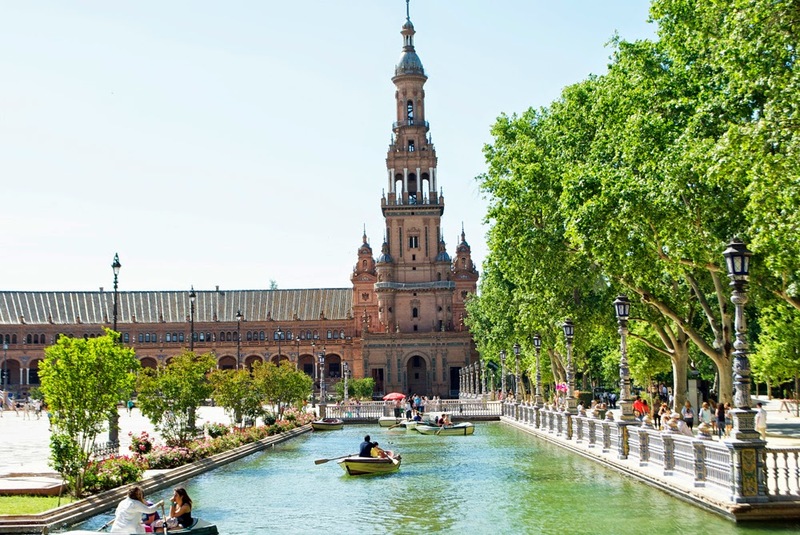 Though I knew there wouldn't a whole lot of time to explore Seville, I didn't want to miss out on the opportunity. Right off of the train station and not entirely sure what we were looking for, we followed the masses to the Plaza de Espana which is only a few blocks away from the train station. I'm glad we stumbled upon this place because it was absolutely stunning. The first image is of the front view of the plaza building and you can't go in it (there are guards everywhere because it is filled with government buildings), but once you walk around the corner you get views like the one above. Pictures do not do this place justice because the Plaza de Expana is beautiful and too large to get in one picture wihtout a panarama view. The building emcompasses a half circle with a small river passing through. The building was designed by Anibal Gonzalez in the Art Deco and Neo-Mudejar styles. There are touristy boat rides and plenty and people selling things like flamenco esque shaws and fans. 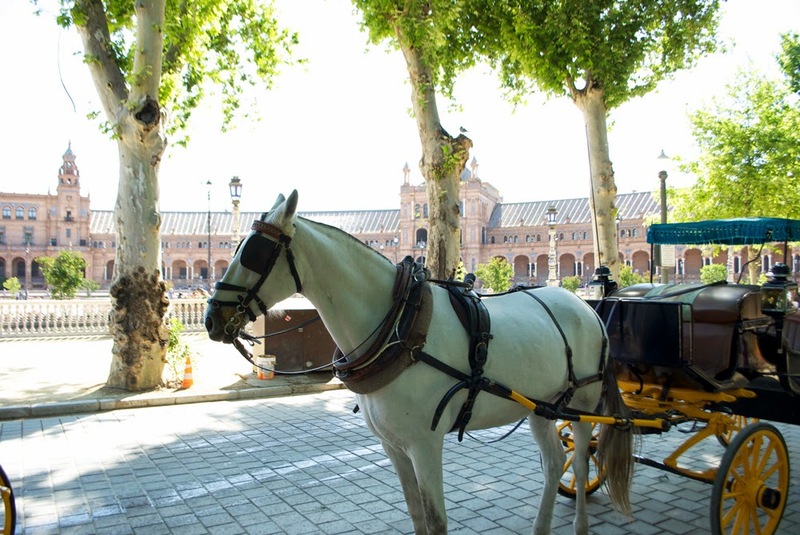 You can also take a ride in a carriage with one of the many Spanish horses. I spent several hours just admiring the beauty and snapping pictures. Seville was very very hot in early May. 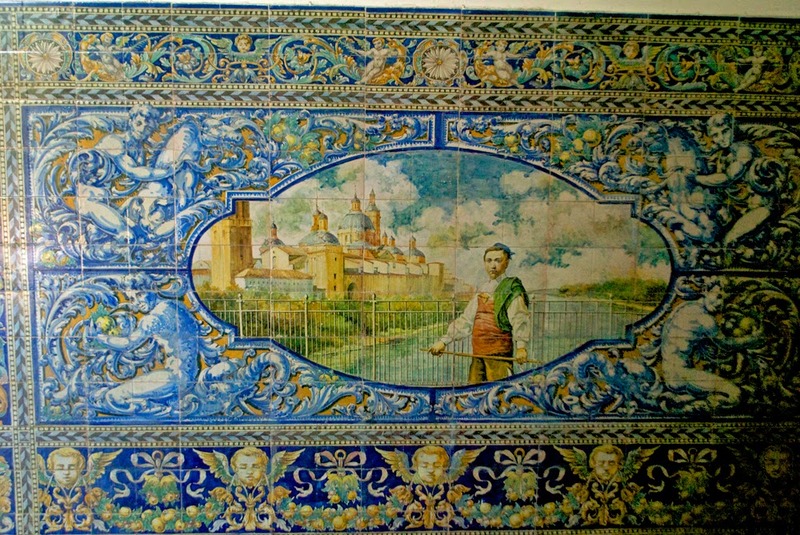 Make sure you take time to pay attention to details like the tiles on the walls, bridges, and province alcoves. 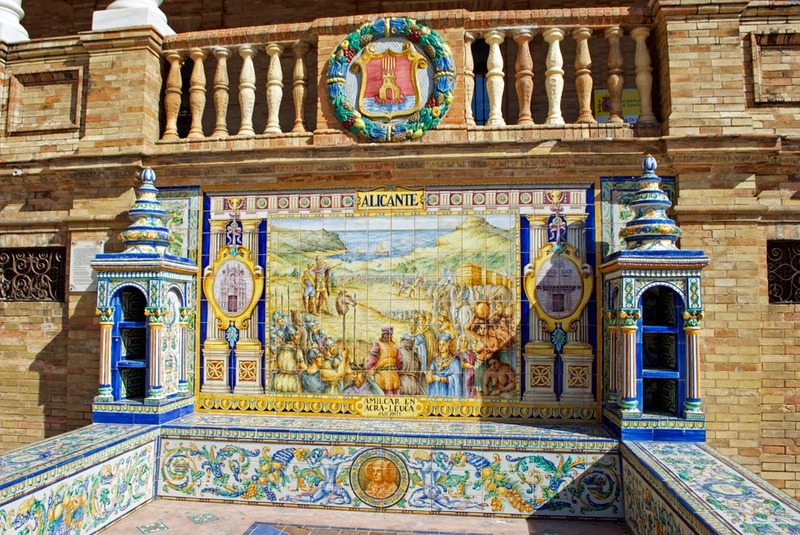 Like the Alicante province alcove below, these decorative little cubbies lined the building and displayed artwork depicting different provinces in Spain. 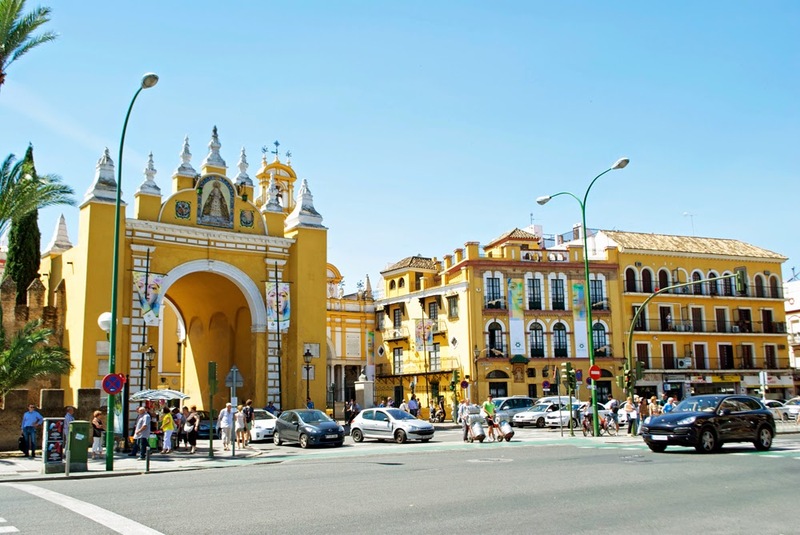 I'd suggest the Plaza de Expana as your first stop in Seville. As I mentioned, we only had 5 hours to explore and Seville is huge. We decided to do a hop on hop off bus to see the city in about an hour and stop in the area of La Macarena for some lunch. The last image is of the Basilica de la Macarena which is the church of Our Lady of Hope Macarena, a revered symbol of hope for the Spanish people. As soon we finished lunch it was time to get back on the bus and catch our train back to our homestay. 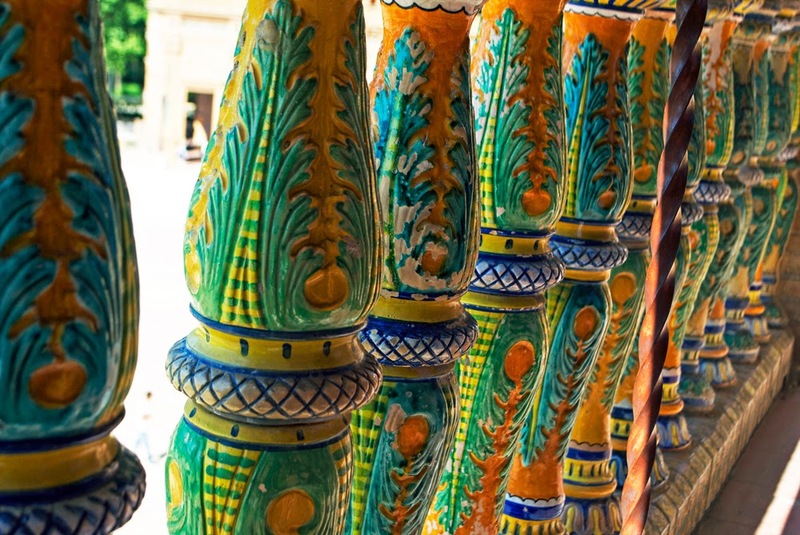 We were just a week shy of the festival celebration in Seville called Feria but I encourage you to check out Margo @ Gutenblogyall's post on the Feria in Seville. The dresses are so pretty! I did however, make it to Feria in Rota and I'll post a bit about that in my next post. 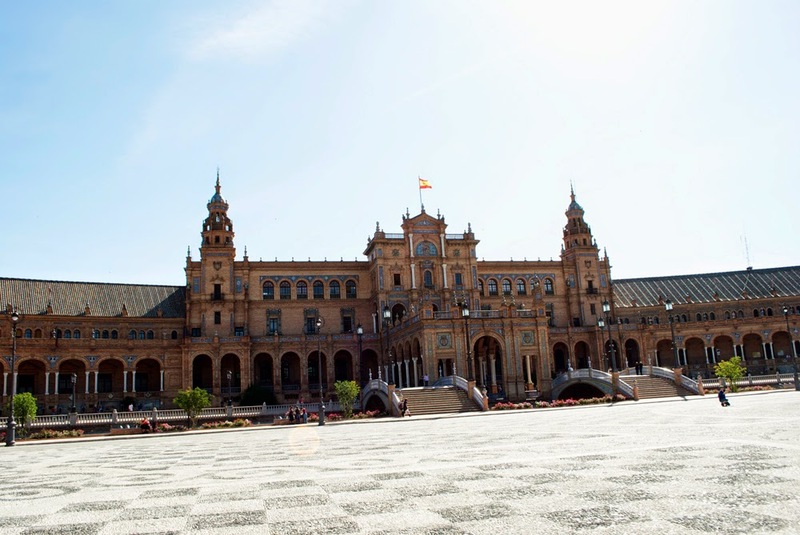 There are so many things to do in Seville and this is just a glimpse at the Plaze de Espana. these photos are amazing - it looks so beautiful there! 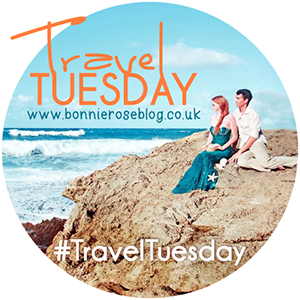 i've only been to barcelona and madrid in spain and would love to see some of the other cities one day too! I can't believe how much Spain I am doing this year. I think I might even have to plan a trip somewhere in Spain next year and take my husband next time. How exciting. Hopefully you will have more than two hours. I feel like I didnt' even crack the surface of Seville. Wow! This place looks so beautiful! 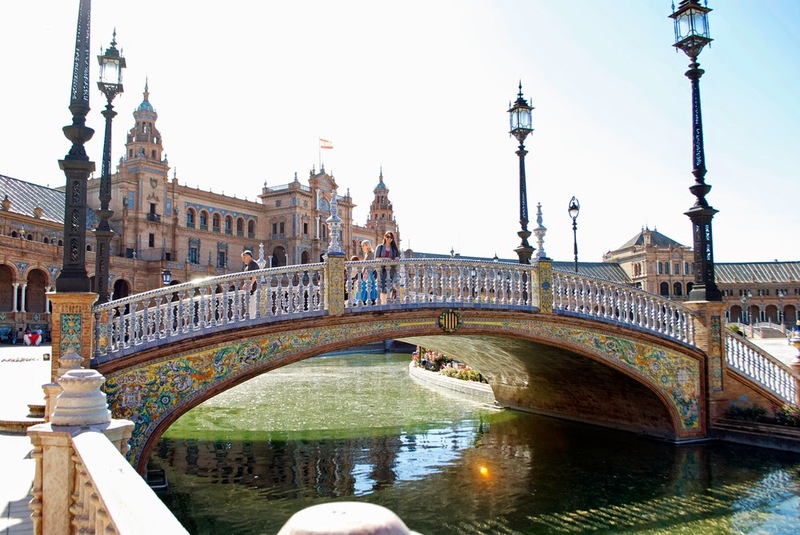 Seville is definitely on my wish list, it looks so beautiful! When we were in Seville it was sooo hot. Too Hot actually. Locals told us it was as hot as summer and we were there in Spring. It was 42 degrees at 7.30 p.m. We still walked around everywhere and enjoyed our time, but can't wait to return in more normal weather. I think this day in Seville was my hottest of the trip. Scorching but we made the best of it. 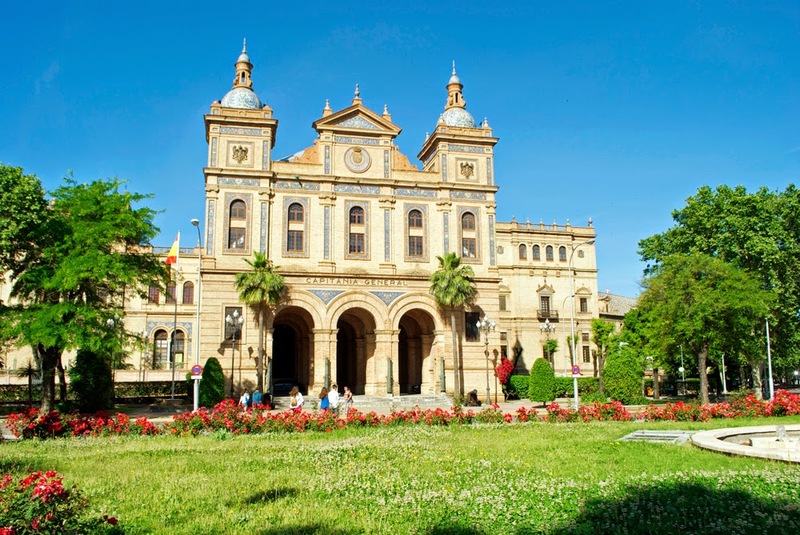 A friend of mine did a semester abroad near Seville and visited the city multiple times. She found it wonderful too and I can totally see why. Love the pictures! wowzers - what amazing pics... I'm pinning this post on my places to visit board!